Keyboard 6Pin DIN to PS/2, PS/2 to USB and then one random keyboard. Homebrewed cable from Molex to Pentium CPU cooler as i don't have original one. Last edited by Morc on 2018-9-14 @ 21:10, edited 15 times in total. With the pci slots, have you had a look at the bios. Specifically if the pci slots are being set by the bios for their irq’s. Just my two cents. McKie1: Thanks for the fix. I already tried that but it stil looks like that nothing fixes. Last edited by Morc on 2018-4-02 @ 19:41, edited 2 times in total. It's possible to upload pics directly to Vogons forum. Btw, was your case really originally containing a PIII? It does look like a very recent AT case and it looks pretty good. 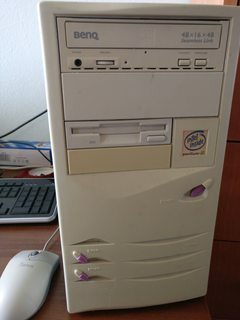 I did some calculations(thanks to sticker from computer store on back of case) and got that the case is something from 1997 - 2000(my uncle was working in that computer store). Motherboard was out last time so i don't know if it had P III originally or the P I and someone sticked the P III sticker on it. Some updates. I've found that there aren't any IRQ errors on the stock bios(looks like the very first BIOS for that board) than on the patched(i had it to have ability to use up to 120GB drive). After switching to the old bios, now everything gets their IRQ numbers. 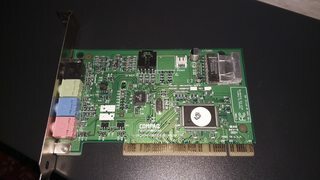 And second thing: I am thinking about buying Compaq PremierSound(Soundblaster AudioPCI) card from my friend. Is it worth it, or will it work in Windows95/98??. Here are even photos of it if someone wants(they're clickable). It'll work fine in WIn9x, but it's not particularly rare, special, or good. Feel free to buy it from your buddy, but don't spend very much for it. gdjacobs wrote: It'll work fine in WIn9x, but it's not particularly rare, special, or good. Feel free to buy it from your buddy, but don't spend very much for it. Thanks! I bought it from him for 5€ incl. shipping. Mobo, HDD(the 2GB one from WD), RAM(i think), CPU, Case, Floppy Drive and CD ROM(hard to say) are same like in this rebuild. Two things were other(Graphics and PSU). 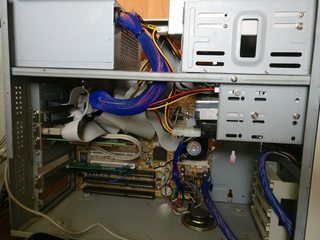 But after looking and inspecting photos i found that the computer had some kind of sound card(due to bad photos i don't know) and other graphics card. I found the same graphics card that was there before, connected it in and it worked. It was a Rendition Verite 2200 PCI. Found drivers here on vogonsdrivers.com installed them and got better resolution + color depth than on the Ali 3147V. But sadly i was unable to find the sound card that was on it. If you share the photo here someone may recognise that soundcard for you if you are trying to get it back to original. otherwise your AudioPCI is a pretty good match for a Pentium 133 unless going with an ISA card, its really not fast enough to benefit from a Live! Whats your main reason for building this PC? you more interested in playing games or with old hardware? chinny22: Thanks. So you are asking why? I don't really know. I had some of the parts laying in my room catching dust so i had to put it in case. And for the second question. I am more interested in the old hardware instead of playing games(maybe sometimes). + the sound card i was talking about(it was first looking like a Sound Blaster 16), I found the sound card in my pictures and it is a Crystal CX4235 ISA Sound Card but i also bought the AudioPCI from my friend yesterday. My journey with Pentium computer continues and i made some changes. I bought SD card to IDE adapter which works fine. Then i bought new shiny EVGA power supply for it. I chosen EVGA 450 B3. I know, it is a bit overkill but it was my first modular power supply i have at home. I also fully rebuilt it. Journey continues and another problem arrived. One problem i seem to have now is that it works just fine on Windows 98 with all drivers and no problems but sometimes it just freezes out of nowhere. I caught it freezing when scrolling with mouse which is a bit awkward.. It was not doing it before but last time i played with it was around June.. I don't think that the new EVGA PSU is doing some problems there but that's why i ask you. 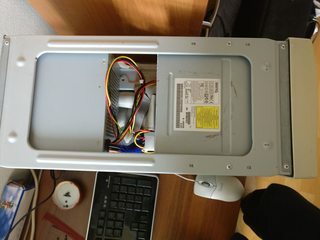 Edit: and i also ask for some help about CPU fan. 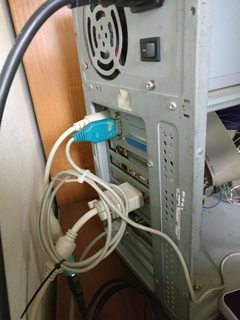 I don't think that it was originally connected with molex cable so it needs to be somewhere on board? I don't think that the new EVGA PSU is doing some problems there but that's why i ask you. I don't really know but maybe your computer needs the -5V rail which the EVGA PSU lacks? I don't think that -5V rail is doing some weird things because the PSU i was using before hasn't got -5V rail either and it was not doing any problems before. Maybe only Windows 98 freezes on SD Card to IDE adapter.. So I was doing some research and found out that the SD adapter is working a bit weird and it is causing those freezes. Switching to mechanical WD drive that I was using before fixed the issue. But other problem showed. 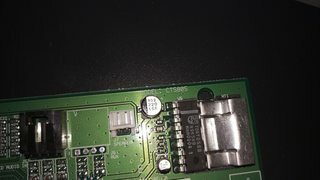 I have a Lexmark 1000 Color JetPrinter and for some reason, my build does not want to even turn on when it is plugged in. If I disconnect the parallel cable, I turn the computer on and I connect it back then it works just fine and also prints. The behavior with connected printer and turning computer on is totally weird as it looks like there is still some voltage in PSU and board, turning it on turns fan but looks like it has low voltages because LEDs on PCI diagnostic card starts to lit up but then it discharges and does not want to turn on until I disconnect parallel cable from printer to pc, I power cycle it with turning off the PSU, pressing power button waiting until it discharges caps totally and I turn on the PSU switch at back. And now I will do some more research. Hardware that works vanilla with all those Operating systems. 3) S3 Trio 64 Should work Vanilla.